I received this beautiful background stamp from Simon Says Stamp Mothers Fathers and Florals new collection on Friday. This stamp set is called Cora. Elegant and intricate background stamp. 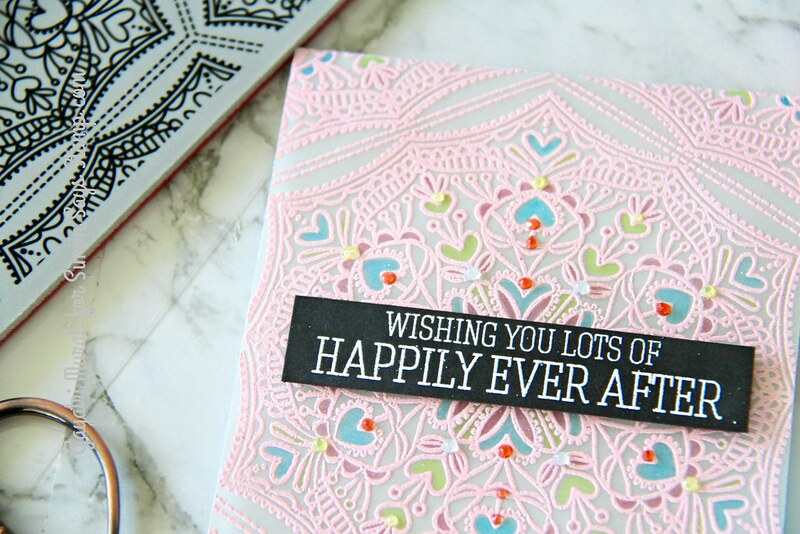 Love the details and all the hearts in the stamp. I believe this stamp is designed by Kristina Werner. The moment I saw this stamp, wedding card came to my mind. So I made a wedding card. inI heat embossed the image on vellum heavy weight cardstock using Nuvo Ballerina Pink embossing powder. Love the soft pink on vellum. Subtle and pretty. I then used copic marker to colour at the back filling in just a few of the details. I used B04, YG23, RV14 copic markers to colour. Adds a bit more colour and enhances the details on the embossed image. I trimmed the vellum such that I could score and make a flap to the top. I adhered this flap behind the fog card base. 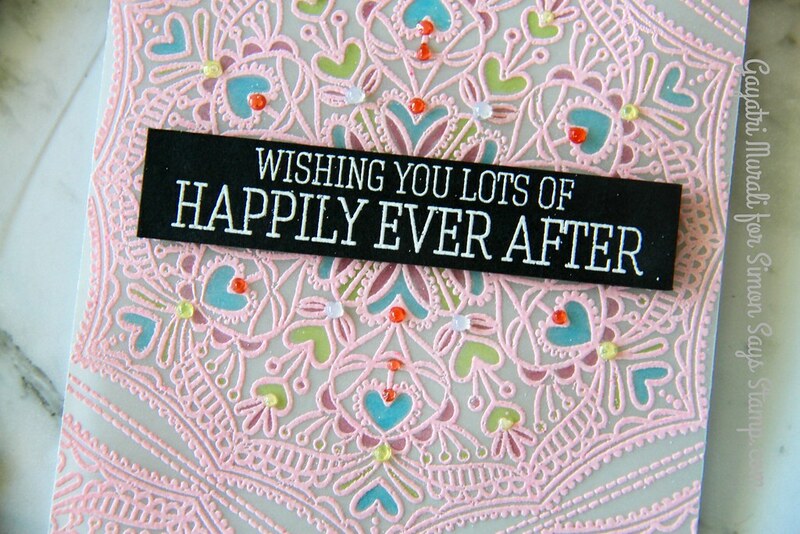 The sentiment is from an older Simon Says Stamp stamp set called Congratulations. I white heat embossed the sentiment on a strip of black cardstock and adhered on the centre of the vellum panel using foam adhesive. I also adhered another foam adhesive on vellum behind the sentiment panel and adhered the panel on the card front. I brushed some clear shimmer on the panel. Finally added Nuvo Jewel Drops in blue, pink and green to finish off my cards. Here are couple of closeups of the card. There are more such gorgeous background stamps released in the Mothers Fathers and Florals collection. All the new release products are available at Simon Says Stamp Store. 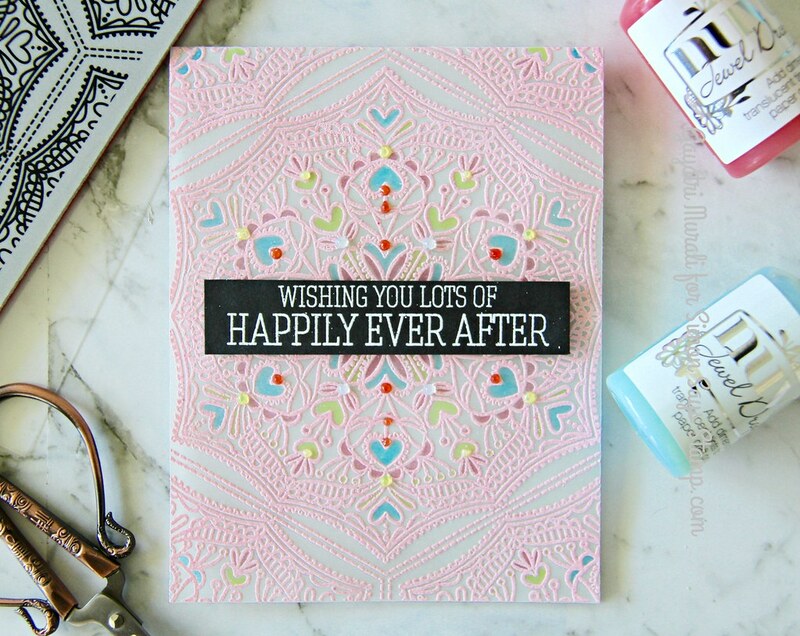 Wow, this is such a cool idea and love the soft pink embossing. Looks amazing!!! These background stamps are stunning! Your card is beautiful! Love the pink!